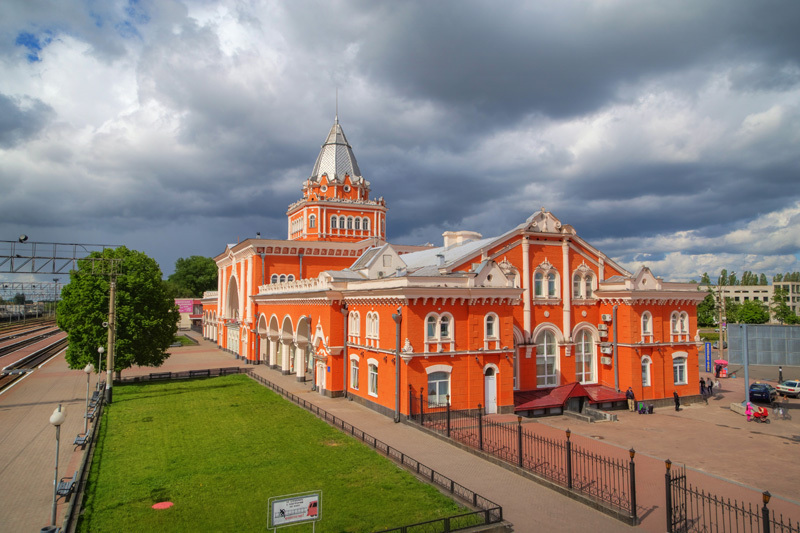 Roughly a hundred miles north of Ukraine’s capital Kyiv is the city of Chernihiv. 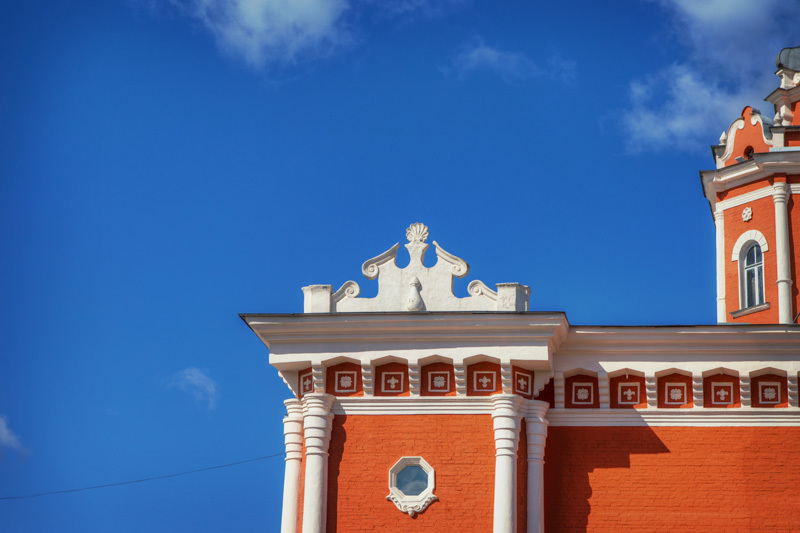 Chernihiv has quite a long history, dating back to the medieval times, and it is also home to Ukraine’s oldest church. 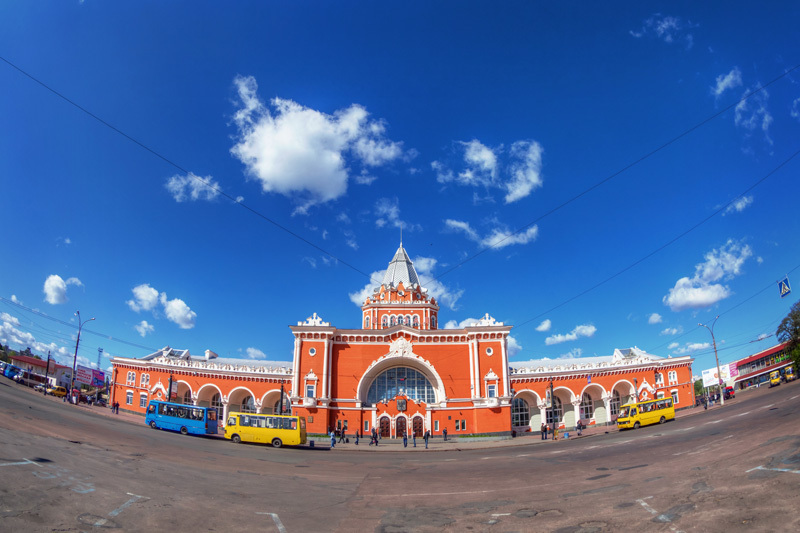 In terms of railroads, the first station in Chernihiv was established in 1893, part of a narrow-gauge branch line of the Moscow-Kiev-Voronezh Railway. 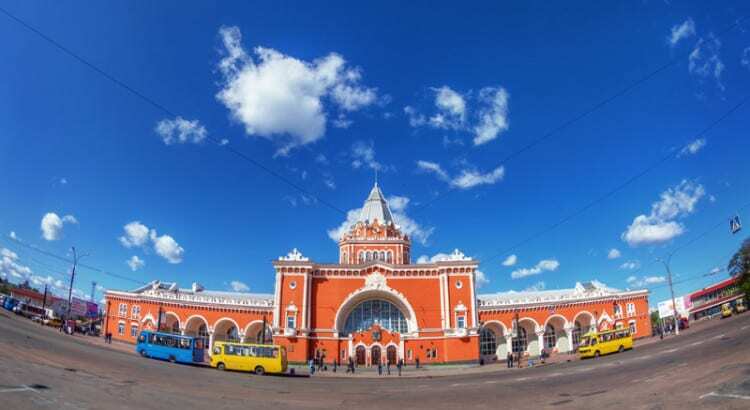 Passengers were carried into the city proper by horses until the 1920s when a bridge over the Desna River was constructed, allowing trains into the main part of the city, where a new station was constructed. 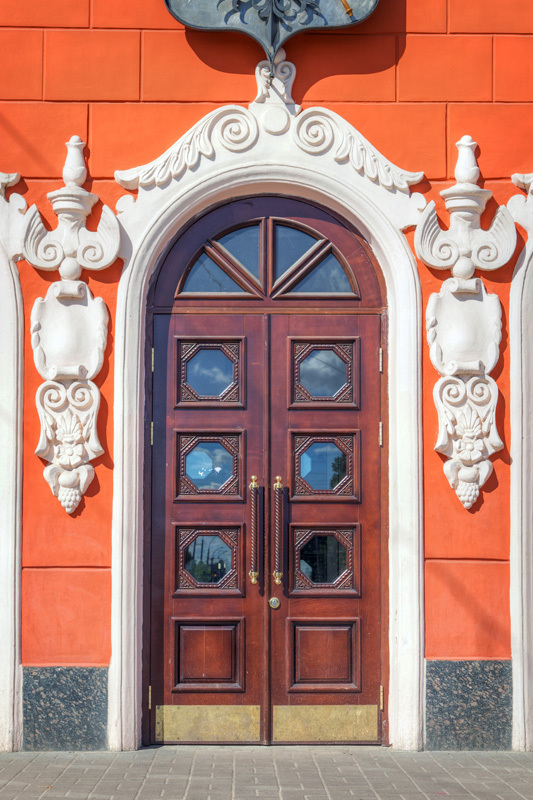 By 1928 there were connections from Chernihiv to Gomel, in present-day Belarus, to the city of Ovruch in Ukraine, and to Ukraine’s capital, Kyiv. 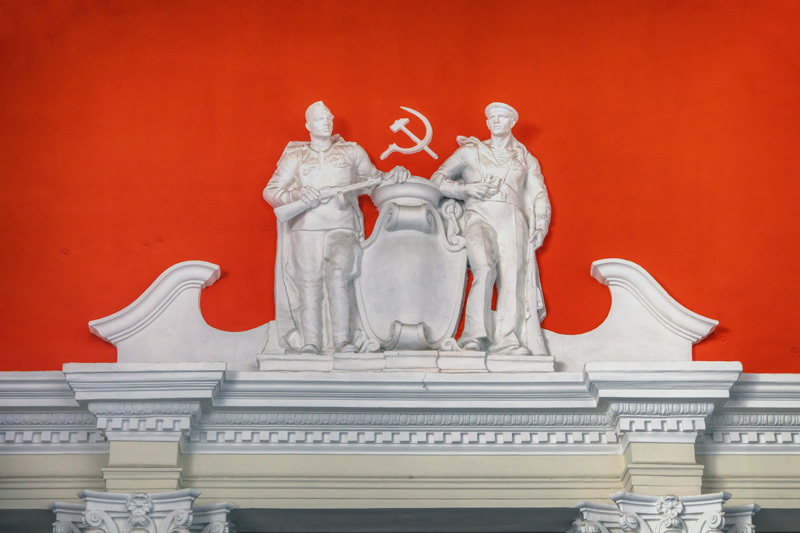 The Chernihiv – Ovruch line was a relatively unimportant one, primarily constructed for military purposes, but in the most coincidental sense had drastic effects on the Soviet Union and the world. 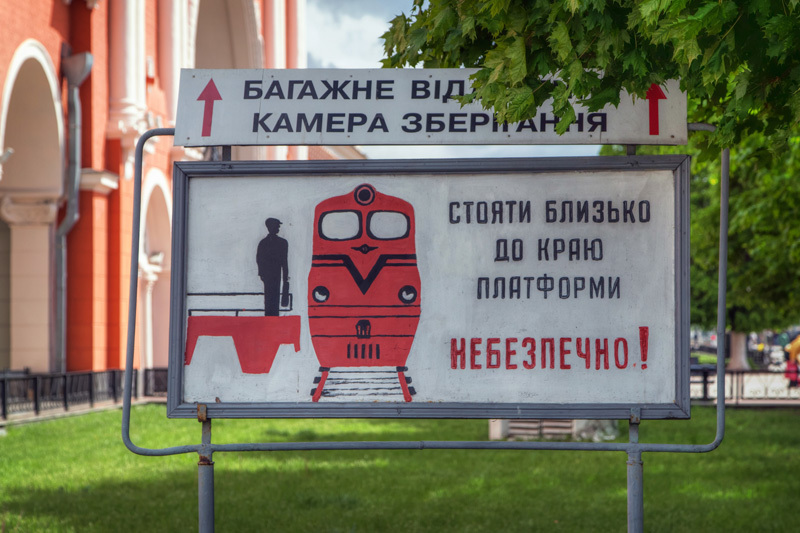 The rail line played a part in the decision of where to locate Ukraine’s very first nuclear power plant, a place the world knows as Chernobyl (Chornobyl would be the proper Ukrainian transliteration). Since the nuclear reactor explosion in 1986, a portion of that rail line was abandoned – a story I’m hoping to flesh out over several posts in the coming weeks. Train from Slavutych arrives at Chernihiv. Slavutych is the “replacement” city for those that worked at the Chernobyl plant, constructed after the disaster. The rail line again played a part in the location of this place. 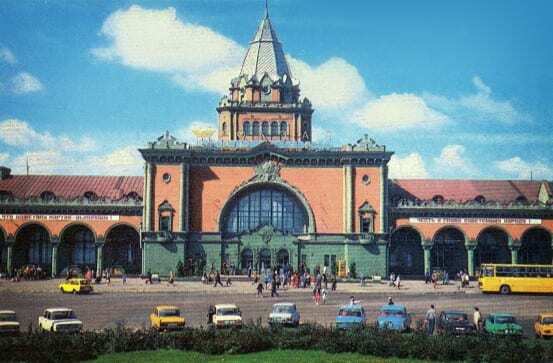 The station that one finds in Chernihiv now was built in 1950. 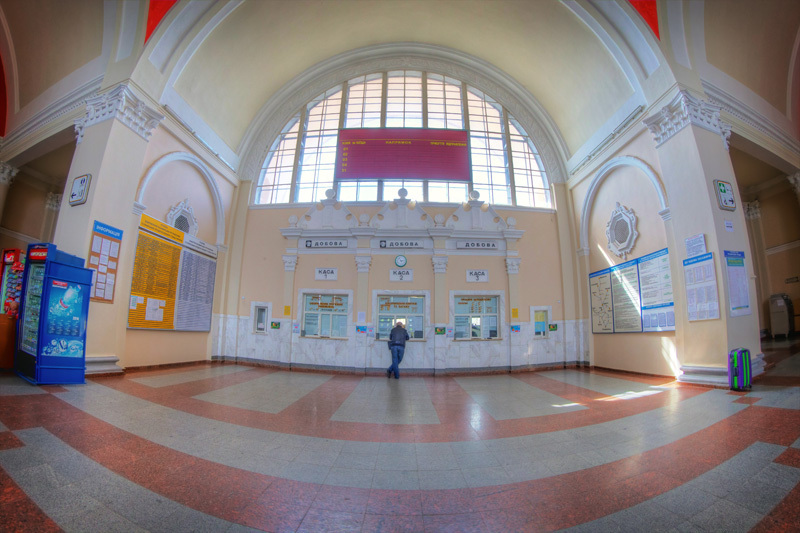 The previous station at that location was destroyed during World War II, or as it is known in former Soviet locales, the Great Patriotic War. 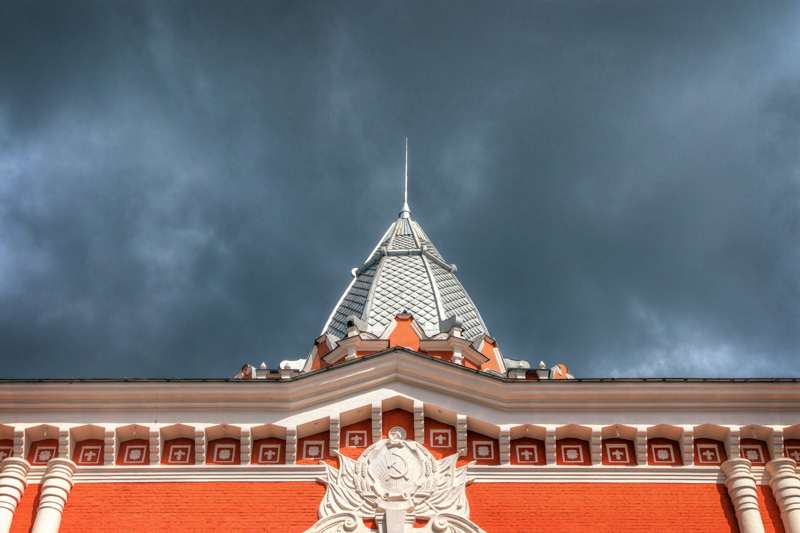 Chernihiv was occupied by Nazi forces from 1941 to 1943, and the retreating Soviet army practiced a scorched Earth policy, which included the destruction of railroad infrastructure. 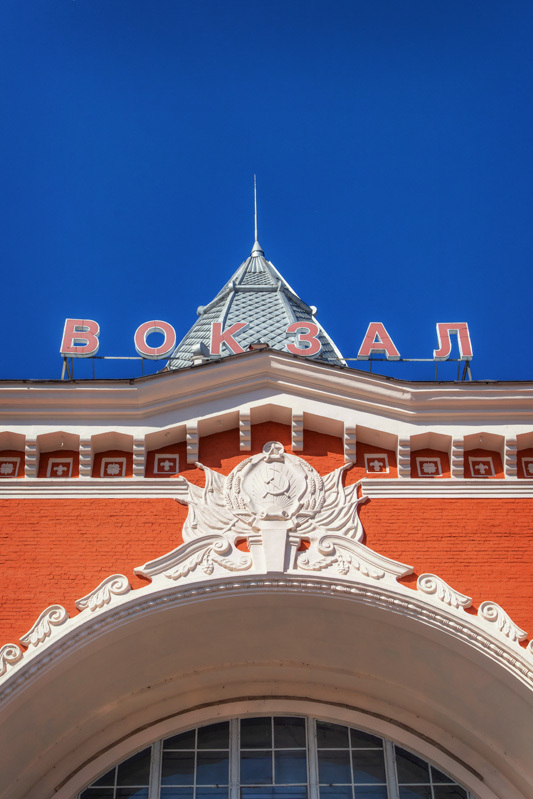 The station was destroyed at some point in 1941, either by Nazi bombardment, or by the retreating Soviets themselves to prevent the Nazis from getting any use out of it. 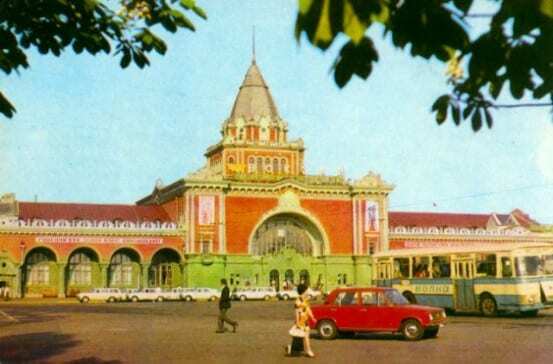 The station was rebuilt in 1950, using the labor of German POWs. 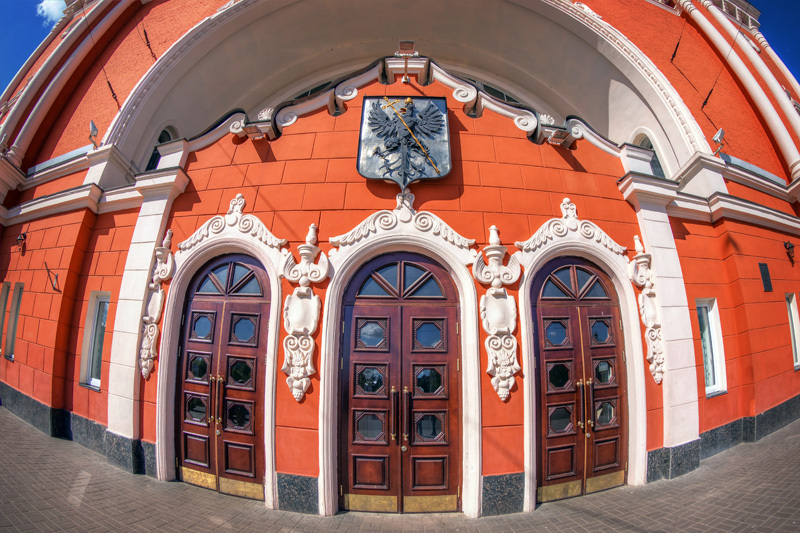 The attractive design comes from Ukrainian Soviet architect Gennady Ivanovich Granatkin, who is responsible for the designs of several stations throughout the Soviet Union, in today’s Belarus, Moldova, Russia, and Ukraine. Old paint scheme of the station, it was repainted to a solid reddish orange around 2003. Photos circa 1970s. 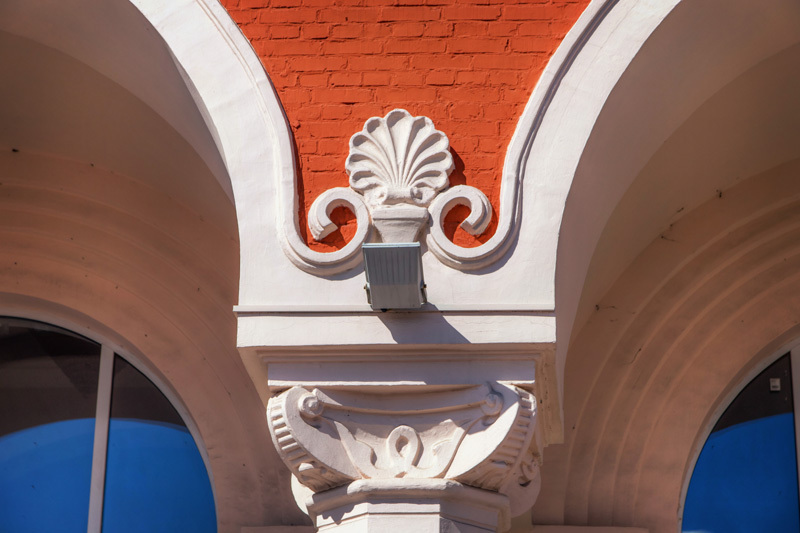 Over the years, several modifications have been made to the station at Chernihiv, primarily being the scheme in which it is painted. 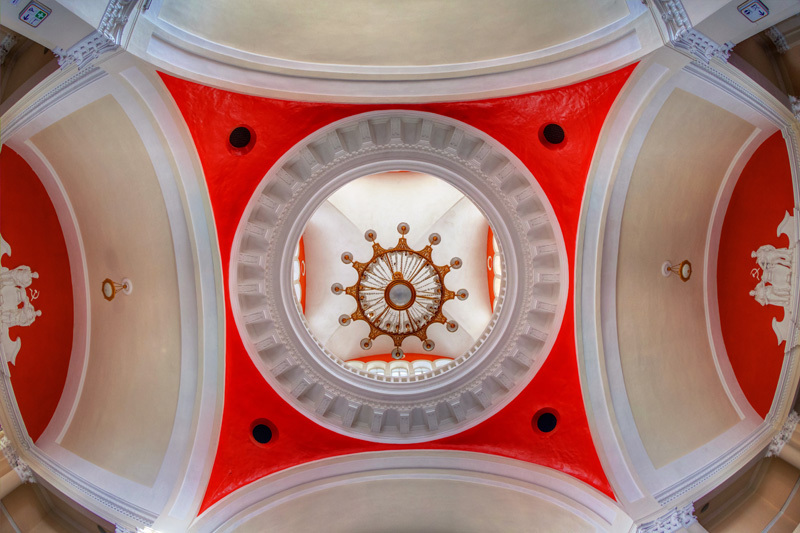 Originally red and green, the station is now a solid reddish orange after renovations in 1999 and 2003. 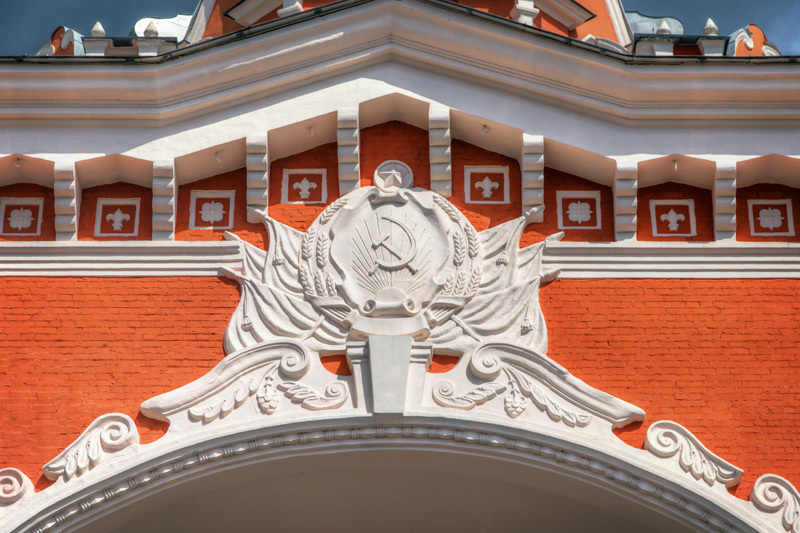 While sculptural elements featuring the Soviet hammer and sickle have been left intact, more current coats of arms have been added to the front and back. 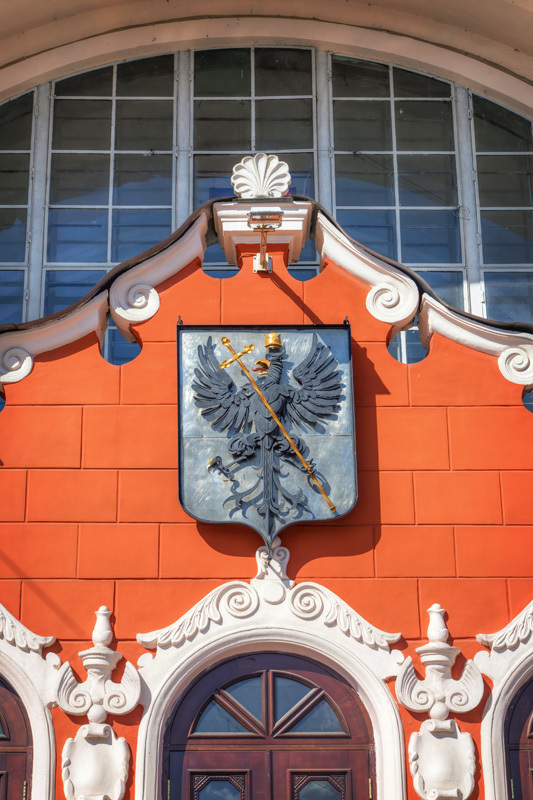 The city’s 1992-established coat of arms – a black eagle with a crown and cross – can be found on both sides, and the coat of arms of Ukraine is visible on the back side of the building. 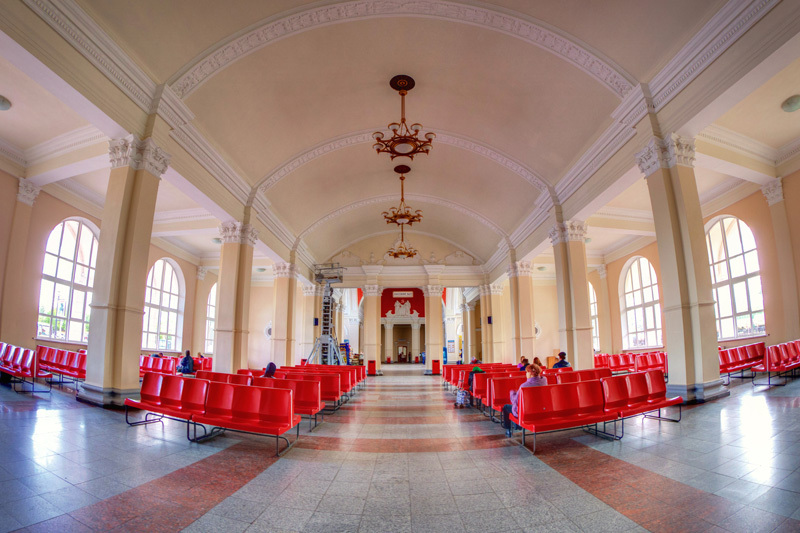 The station is generally regarded as one of the more beautiful stations in all of Ukraine, and is certainly one of my favorites. 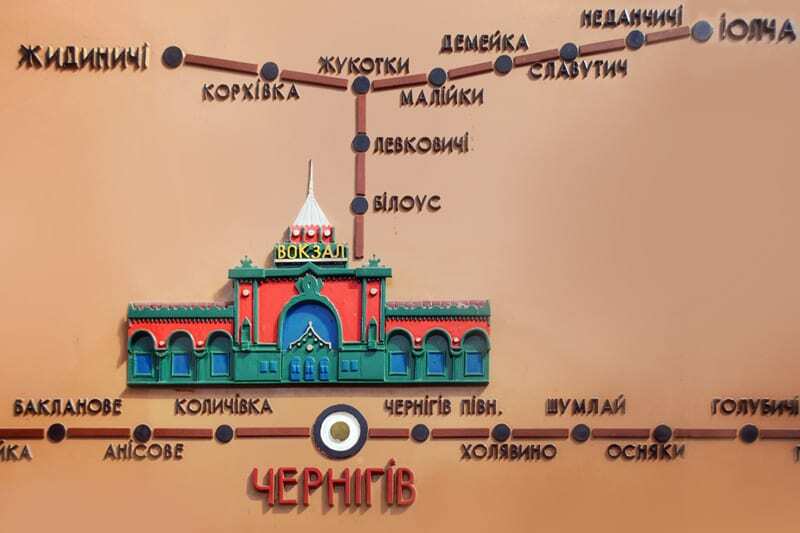 Map diagram of the station in Chernihiv, showing the building’s old red and green paint scheme. The line listed above the station is the remnants of the Chernihiv – Ovruch line – trains from Chernihiv go no further west than Iolcha since the Chernobyl disaster. The 20 kilometer branch line extending from Zhukotky (on the top left of the diagram) to Zhidinichi was closed in 2006 and dismantled around 2008. 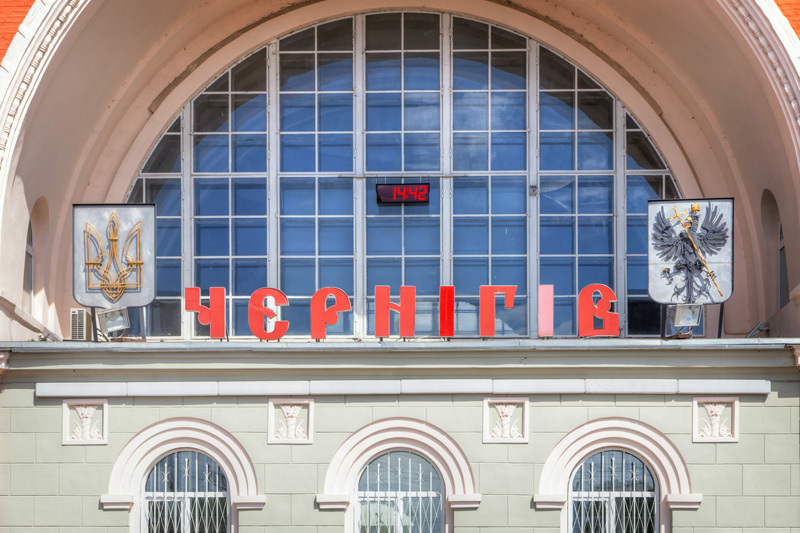 View translation of Cyrillic station names. 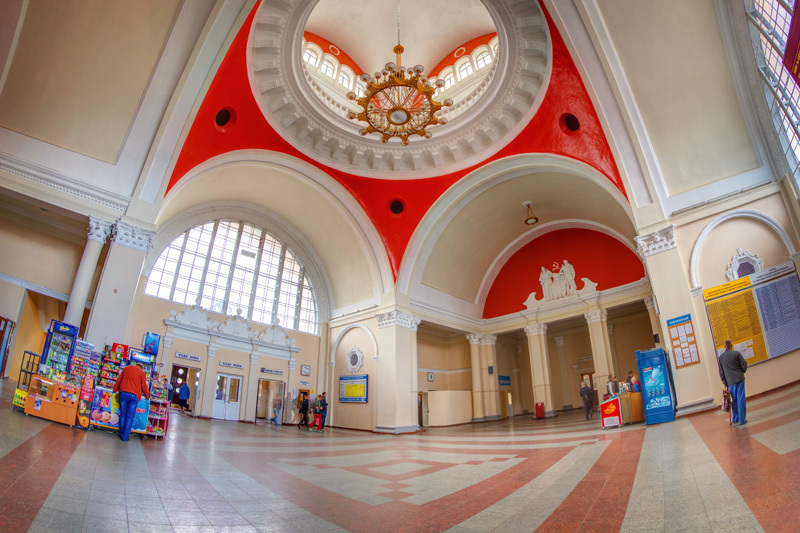 Today one can board long-distance trains at Chernihiv for destinations like Moscow, Saint Petersburg, Minsk, and Odessa. 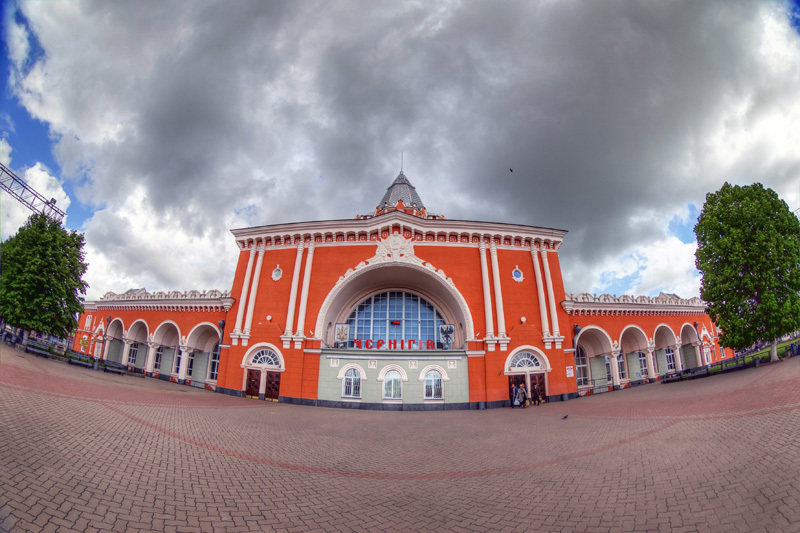 Despite being roughly forty miles south of the border, the station serves as a border control point for trains arriving from neighboring Belarus. 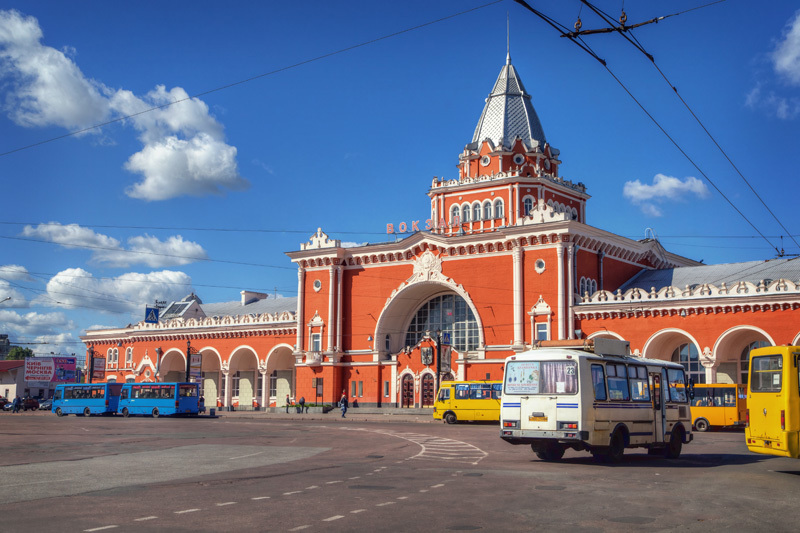 Two commuter operations, one to the city of Nizhin, and another to Iolcha on the former line to Ovruch, also operate from Chernihiv. 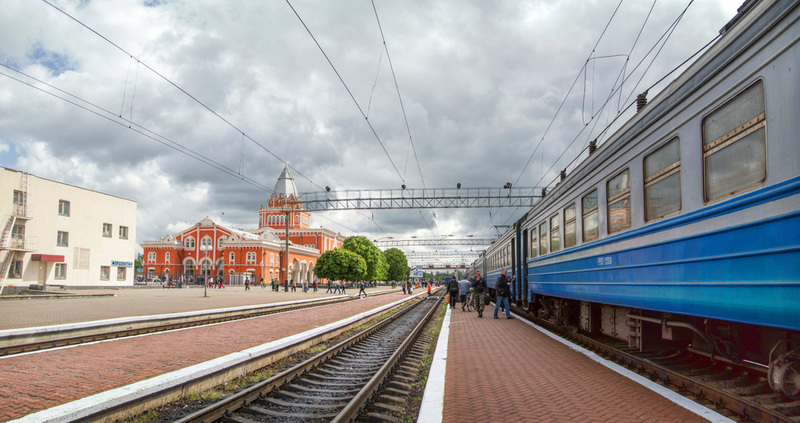 Though a portion of the aforementioned line was abandoned after the Chernobyl disaster, it is still possible to take a train to the Chernobyl plant, although not directly from Chernihiv. 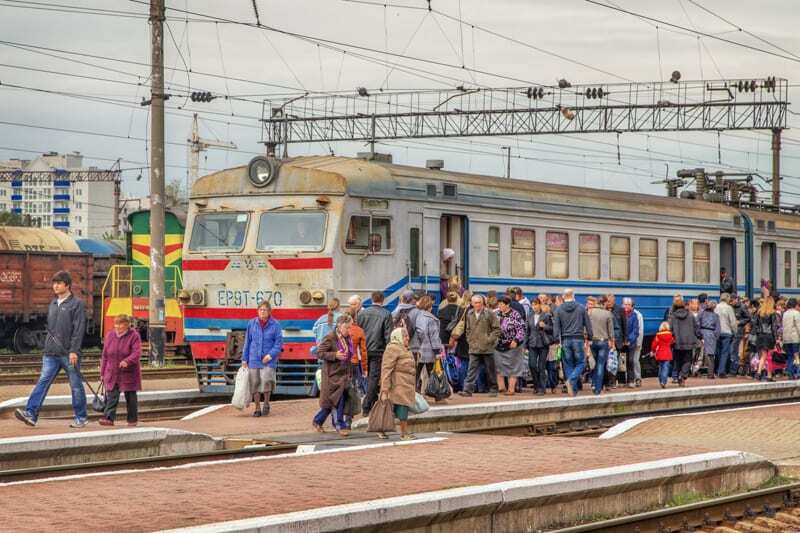 Several daily trains operate from Slavutych to Semikhody, which is adjacent to the Chernobyl plant – though that is a story for another day. Fascinating (and scarily timely) stuff. You certainly are well traveled. 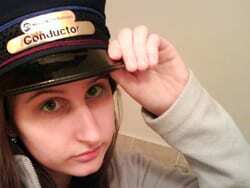 Thanks for taking us along! 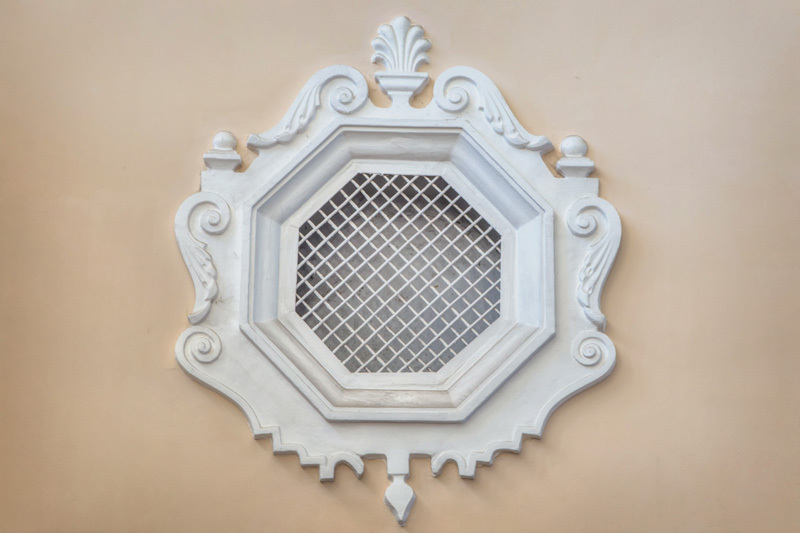 Your Blog is excellent- interesting writing, and great photos. This posting is terrific, but in the first paragraph it states that “The station was rebuilt in 1950, using the labor of German POWs.” Is that correct information, war prisoners still being incarcerated in 1950? That one I don’t know. 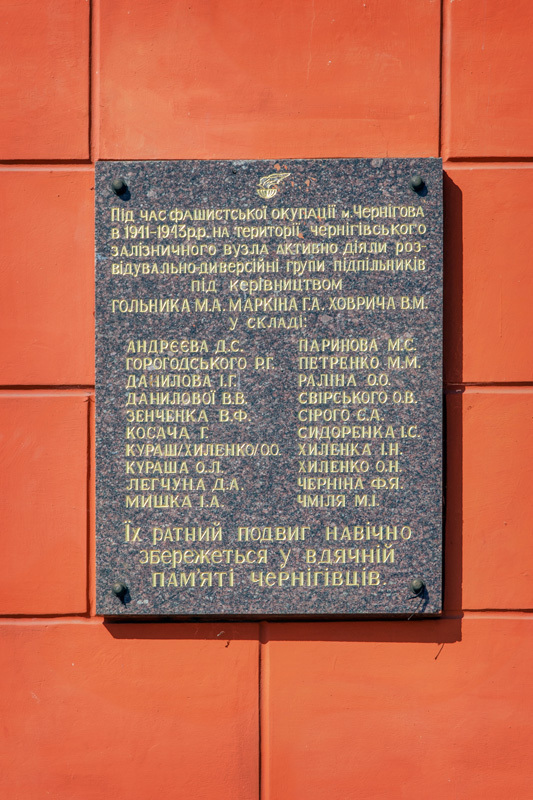 The anecdote that seems to be mentioned (which nobody seems to be able to verify) is that in at least one instance a former POW that was granted freedom decided to stay in the Chernihiv area because all of his family members were killed. That would of course be an abnormal case. If this is to be believed, there were still 29,000 POWs being held in the USSR in 1950 though. I cannot speak in general, but I in person do know several people here in Austria who have been detained in sowjet POW camps until 1955 (26th October end of occupation of Austria by allied forces US USSR England France) but that did not allow them to return from Siberia as they had no Austrian passports due to the Anschluss of 1938 when Austria seized to exist as a nation (!). 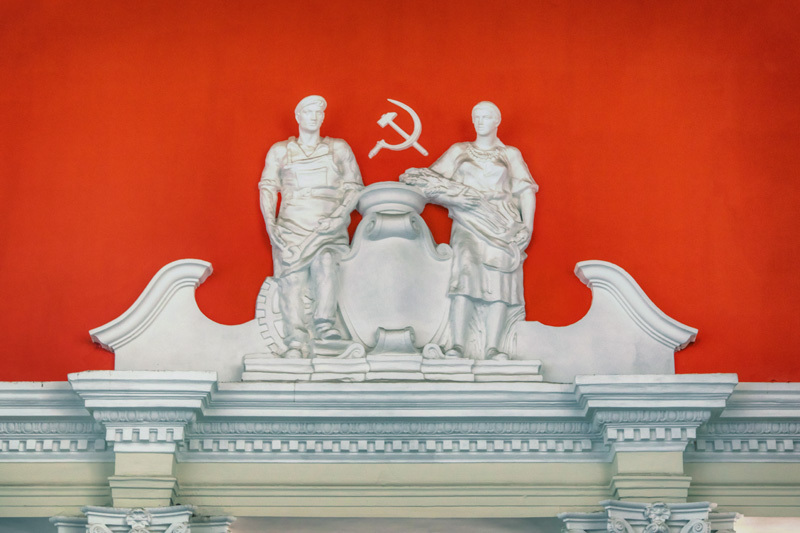 Thus the Union of Socialist Sowjet Republics did not allow these prisoners to leave Stalin’s empire for their home country but only set them free from the POW camps and had to look for themselves (mainly in far eastern Siberia, working in mines, etc) until they had earned enough to pay for the long way home and apply in the western USSR for an Austrian passport. The images of the hi-tension catenary compel me to mention that the very first application of such a system for rail transportation was in 1907 between Stamford and the Wakefield section of the Bronx , making the New Haven the progenitor of a rail electrification system which is now “standard” every where in the World.